Planning success gets results. Almost everyone desires to be successful – professionally and personally. Those organizations and individuals that get clear about what success looks like and what needs to be done to achieve success, attain their goals. Planning provides us with this clarity, in our direction and actions. The last few weeks of each year are critical to an organization’s success in the new year. Unfortunately, many leaders think about planning at this time of the year, but fail to act on those thoughts. In this blog we will talk about why planning is important, common mistakes made during planning, and three levels of planning leaders need to address to prepare for the coming year. Identification of resources. Now is the time to look ahead and plan for any changes in needed resources. Will you need more people? Will you need more materials or an upgrade to any equipment? During planning discussions the answers to these questions and others will become apparent. Impending issues. During planning you may identify upcoming issues that may need to be resolved in order to achieve the goals you will set. Perhaps a key employee is retiring and you need to find a replacement because they are critical to a project. Teams expect it. Everyone wants to follow a leadership team that can spell out the future – even if the future isn’t bright. If team members know the strategic plan (and even participate in developing it), they will invest more of their time and energy into achieving the plan. Set Goals. This is the opportunity to set your goals for the new year. In our next blog we will talk more about how to set goals. Goals are part of your plan and describe the end result of all the organization’s efforts. Too “Pie in the Sky.” There is always the tendency to set lofty goals and make poor assumptions about the path to achieve the goals. The plan must be achievable, especially when projecting the financial aspects of the plan. Plans should also be consistent with the mission and vision of the organization. Others Not Involved. Plans should be developed as a team effort and include all appropriate people as part of the process. Plans should not be “dictated” but rather created using a process that ensures everyone’s buy-in because they participated in the process. Progress Not Measured. Progress toward the goals of an effective plan must be measured. Often plans can change or be “tweaked” to reflect changing resources or different demands. Periodic measurement of progress toward goals will ensure that any adjustments needed are part of the ongoing planning process. No Schedule. Every project or effort should have a schedule developed to ensure that the effort stays on track. Without a schedule for progress reviews or completion, the tendency is to put everything off until the end of the year – not good, The last quarter of the year is typically already too busy. In addition, some projects are dependent on the completion of other projects. A master schedule ensures that efforts are synchronized. There are 3 levels of planning success that a leader should focus on for the new year – Strategic Planning, Project Planning, and Personal Planning. Let’s look at each a little closer. Strategic Planning looks at the organization’s goals and the path to achieve them for the next year or longer. Consistent with the organization’s mission and vision, the strategic plan should be done as a team effort with all stakeholders involved. Sales and Marketing, Finance, and any other partners should be represented in development of the plan. When completed, the strategic plan should be shared with all members of the organization to assure them the path forward is well-thought-out. Project Planning. The new year is an excellent time to review the status of each project underway or projected for the new year. Senior leaders should require project managers to identify the resources they will need to be successful in leading the project in the coming year. Managers should also identify any potential problems they may encounter in the new year. Personal Planning. 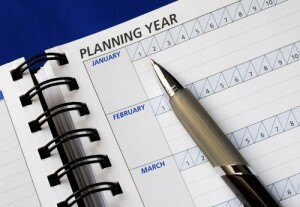 The is an opportune time for the leader to start the new year right by focusing on their personal planning. Consider how you can maximize your time with family. When will you be taking vacation? What do you want to do differently in the new year? How will you continue your professional development? You should also plan for your organization’s events for the coming year, such as a summer party, holiday party, award programs, and an annual meeting. Planning these events for the new year will help others plan their work to assure maximum participation in these events. In next week’s blog we will take a closer look at a critical part of planning – setting and achieving goals. Meanwhile, take the self-assessment for planning and learn more about this vital leadership competency.